I rather think this has passed me by in recent years, a bit like Hallowe’en. Black Friday is upon us. The day following Thanksgiving. A day when stomachs are still turkey-full and yesterday’s key lime pie barely digested, then gives way to a paroxysm of greed, when shoppers descend like vultures to pick up pre-Christmas bargains on the busiest shopping day of the year. It appeared to have originated in Philadelphia in the sixties, either to describe the fact that retailers slipped from red into black on that day, or the post-Thanksgiving traffic was so unbearably heavy. 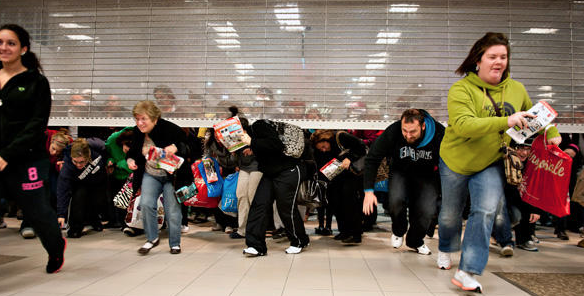 Some stores opened their doors at midnight and braced themselves. The UK seems to have joined the feeding frenzy, which indeed it has become. Stores were criticized because of their lack of security, as people literally fought for bargains in-store. French shoppers, it would seem, are less ready to be seduced by the US phenomenon than their British counterparts. This from today’s ‘Independent’. Were this an isolated circumstance it might be newsworthy, but what follows is simply a sample of events mirrored all over the decadent, culture-hungry West. At least three people were arrested in the mayhem and several people were injured, including one woman hit by a falling television. In London, officers were called to three Tesco stores and an Asda amid fears of confrontations in heated queues but after attending the 24-hour supermarkets in Edmonton, Willesden, Surrey Quays and Edgware, a spokesperson said no one had been injured or arrested. Images posted online showed chaotic scenes in Edmonton, with witnesses describing “mayhem” as discounted coffee machines went on sale, while footage from an Asda in Wembley showed people fighting over televisions. Seven Tesco stores in the Greater Manchester area saw disorder. Several hundred people reportedly tried to storm the Wigan branch, while more than 500 shoppers descended in Ashton Road West. For some time, I had been looking for a pair of boots. I called a store in the UK, who politely informed me that an online order might be delayed by a day or so because it was, after all, ‘Black Friday’. I cannot imagine, in my wildest nightmares, camping out in freezing conditions in order to be first through the doors in the wee small hours to grab a TV, a microwave or, indeed, a pair of boots or, worse still, come to blows with equally determined buyers. I have written elsewhere about the pursuit of luxury and a segment follows. We might redact the text for Black Friday to read ‘the love of what money can buy is the root of all evil’. Were I for some reason, unable to obtain my new boots, the sky would not have fallen. No lives would have been lost and I would have relinquished little more than sartorial elegance, which is neither a blow to my pride nor a physical necessity. I am at a crossroads of sufficiency. I really have too much and am looking for ways to shed what has become too much to carry, to wear, or to amuse myself with. The other day, I discovered a suitcase full of winter clothing I had forgotten I had. H’m.